[ak-wee-ess] comes from Latin acquiescere: to give oneself to rest, hence to find one's rest or peace (in something); without protest. You are currently browsing the tag archive for the ‘calvin harris’ tag. Remember how awesome I Created Disco is? With songs like “Girls”, “Loves Souvenir”, “Vegas”, “This is the Industry”…(I would list the ICD entire track list), Harris gave 2007/8 a reason to Party Hard. Heck, even the Gobi tent was pretty decently filled during the Prince set at Coachella (from what I heard)! Calvin Harris did create disco with his first LP. And I really do think “Electro Man” is one of the top dance tracks in the past few years. More, after the jump! Alright, so today I only wanted to see Silly Kissers, which I missed, trying to redo my last post which vanished because I was stupid and I didn’t save. And also, I wanted to see Fischerspooner but missed quite a bit of that because a big bottle of Australian wine got in the way. Stupid wine. I did catch a bit of Fischerspooner, the New York duo, before deciding to leave because it was not fantastic enough to keep me there. I knew that today (Day 1 of Osheaga) would be a big day for me…I need to rest. Nonetheless, I still ended up sleeping at 4am. But at least it wasn’t dancing until 4. So I achieved my said rest, sort of. After the jump for music (including a song from Fspooner) I’ve been listening to a lot lately…though not all of it because I plan on releasing another mixtape and JAM PACKED soon! Can You Stay Up For the Weekend, and Blame God For Looking Too Old? Hmm interesting video and as usual his famous diamond studded bee hive sunglasses make an appearance. “Sunglasses” are becoming so iconic. Straying away from their initial function to protect the eyes from harmful UV radiation, or if you’re a super star, all those flashing lights, sunglasses have become an accessory, a fashion statement, and a huge money maker for the merch peeps. 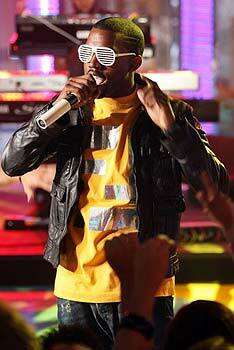 Remember Kanye’s Graduation sunglasses? AND probably the coolest pair I’ve ever seen worn by a certain Beyoncé Knowles? It don’t matter if you can’t see out of them, as long as you look super fly. Like most stylistas in the biz, I think that’s what Harris was going for. Who created disco? Calvin Harris. And hence, the wikkid disco ball glasses. Check out my previous post on Calvin Harris. I’ve got love for Calvin Harris. Ever since I heard his infectious disco dance hit “Acceptable in the 80’s” on BBC’s Pete Tong one faithful day in 2007, I was hooked. I scrambled and scrambled trying to find more info, trying to find more music, and am supremely happy I did because I discovered his debut release I Created Disco which now holds a spot on my mahogany lined shelf of greatest albums along with my leather bound books. For SRS. Calvin Harris is finally back in the studio and gives us the new single “I’m Not Alone”. YES THAT’S RIGHT! CALVIN HARRIS IS BACK!!! I love music and want to share as much of it as I can! My promise with this site is that I will only post things I like. You won't find an MP3 on here that I haven't danced and sung my heart out to or other forms of art that I don't absolutely adore...etc. Hopefully you might grow to feel the same way too! A caveat: all MP3's and other copyrighted media are used solely for the purpose of promoting and exposing an artist/band/individual. So please support the artist! Buy their albums/works! Go see their shows! If you are the artist or representative of said artist and would like the posted item to be removed, please post a comment or email me and I will gladly do so. Also, if you have promos, remixes, news, etc etc, email me and I'll check it out! Thanks so much for visiting this blog!